NASDAQ | Community Options, Inc.
From Syracuse, New York, to Las Cruces, New Mexico, over 10,000 runners, spectators, sponsors, and volunteers participated in the Cupid’s Chase 5K Run on February 12, 2011. Some locations benefited from balmy weather, while others were faced with blizzard-like conditions. Regardless of the weather, love was in the air! In Chicago, our newest operating city, 400 runners and spectators were in attendance, some of whom dressed as Cupid, complete with bow and arrow. Other locations hosted local teenagers running as a group, and mothers with strollers walking the course. Whether the inspiration to participate comes from being a runner or simply supporting a good cause, the Cupid’s Chase 5K Run has established itself as the largest national, simultaneous 5K run in the United States. Community Options was fortunate to have the support of numerous corporate sponsors, resulting in an overall amount raised of $100,000. All profits from this event will be used to support people with significant disabilities in achieving their goals of independent living and competitive work. With a prestigious line-up of emcees, including Mrs. Pennsylvania USA, Erin Joy Landis, and Ms. Connecticut USA, Regina Turner, Community Options was able to promote its mission while energizing runners for the start of the race. Other emcees included notable news anchors from major networks across the country, including Ines Rosales from Good Day New York. Community Options has already begun working on the 2012 Cupid’s Chase 5K Run and looks forward to seeing you at next year’s event on Saturday, February 11, 2012!! For one Northern New Jersey teenager, the transition from childhood to adulthood through his upcoming Bar Mitzvah is filled with good deeds. The meaning of the word Mitzvah refers to a moral deed performed as a religious duty. As such, the term Mitzvah has also come to express an act of human kindness. (Wikipedia). 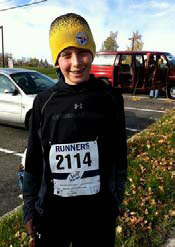 In addition to studying for his upcoming Bar Mitzvah, Robbie Kresch made the decision to raise money for two charities that are important to him by running in five different 5K races. Fortunately for Community Options, Cupid’s Chase 5K Run was chosen as one of these races. 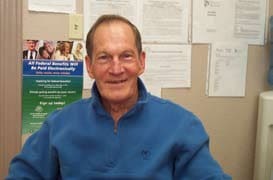 “Health and fitness are really important to my family and me,” says Kresch. “My Dad loved to exercise-running, cycling, and tennis were three of his favorite things to do,” headed. Kresch is asking for donations in any amount to support his efforts to raise money for Purrs N’ Pups Animal Rescue Team as well as Hearts and Crafts Counseling. Kresch is donating to Purrs N’ Pups because of his love for animals and because he got his dog from them. Kresch chose Harts and Crafts because they helped him, his sister and his mother when his father passed away. To date, Kresch has raised over $5,000 for his charities of choice and continues to schedule himself for upcoming 5K’s in the area. Kresch has now run in three races including Cupid’s Chase, never posting a time higher then twenty-seven minutes. Bill Barry Ran his 1,000th Race! Bill Barry, of El Paso, Texas, was surrounded by friends and loved ones as he ran his 1,000th race at Cupid’s Chase 5K on February 12, 2011. Prior to the race, Barry indicated that he would be back again next year and we can’t wait to see him! El Paso hosted over 100 participants this year and hopes to double that number in 2012! Non-profits celebrate their accomplishments in many different ways. Community Options, a national non-profit that supports people with disabilities, began preparing for its third annual Cupid’s Chase 5K Run in March of 2010. This year, Community Options benefited from the involvement of a variety of contributors, ranging from individuals such as Mary Pat Christie, first Lady of New Jersey, who took on the role of National Honorary Chairperson, to corporations such as Withum Smith + Brown, Gunlocke Furniture, Dani Leather, Haldeman Ford and the Bloomberg Foundation. These corporations and the many others who sponsored this year’s event have demonstrated an individual and organizational commitment to corporate social responsibility. Community Options has worked tirelessly with major corporations across the county to garner support for Cupid’s Chase 5K and its mission to support people with disabilities. “I encourage corporations across the United States to become involved with the Cupid’s Chase 5K Run that supports an important cause – community housing and employment for people with disabilities,” says Mary Pat Christie. “Community Options is a fantastic cause to align with to increase your corporate social responsibility efforts,” she added. As a result of this hard work, Community Options, alongside of is corporate partners, Withum Smith + Brown, Gunlocke Furniture, Dani Leather and Senator Joe Kyrillos of New Jersey’s 13th Legislative District, had the pleasure of ringing the Opening Bell at the NASDAQ on Tuesday, February 1, 2011, just in time for the 2011 Cupid’s Chase 5K Run. “Ringing the Opening Bell at the NASDAQ is the symbolic culmination of the work the organization has done this year to prepare for our largest annual fundraiser,” says Robert Stack, President and CEO of Community Options. “We were very lucky to have the corporate partners we had and the support of the First Lady of New Jersey, Mary Pat Christie, all of which made this event a great success,” he added. Community Options was thankful for the opportunity to ring the Opening Bell at the NASDAQ in celebration of corporate social responsibility, and cannot think of a better way to thank their corporate partners than to have included them in this experience. All proceeds from the event, including the overall $100,000 in sponsorships raised, will be used to provide necessary services to the people with disabilities supported by the organization. On the day of their wedding, most brides are worried about seating arrangements, holding back tears while walking down the aisle, or getting their hair just right. This was not the case for Kate O’Keefe, Connecticut General Assembly aide, who ran the Cupid’s Chase 5K Run in Hartford on the day of her wedding. A few weeks prior to her wedding, O’Keefe became aware of Cupid’s Chase 5K and decided that nothing would ease the stress of her wedding day more than running. O’Keefe started running in high school to train for soccer, but it was not until this past summer that she fell in love with the sport. O’Keefe received a lot of support from her family and her fiancé, Kenny, who is the first person O’Keefe looks for at the finish line. “Kenny and I have been together over 4 years,” says O’Keefe. “We got engaged on February 13, 2009, so this weekend has so much significance for us,” she added. O’Keefe’s father is a judge and he is marrying the couple at a small ceremony of family and friends following the run. O’Keefe’s mother is her Matron of Honor and Kenny’s son is his Best Man. “It is truly an intimate family affair with the people who are most important to us and we could not be more excited,” said O’Keefe. 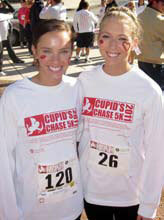 Running for a cause is highly important for O’Keefe, which is why she chose Cupid’s Chase 5K Run. “I like to run for a cause because I get so much out of just the act of running that if I can do that and even touch one person or help them in some way then that is important” said O’Keefe. “I’ll run pretty much any race, but the ones that help those less fortunate are the ones that really have an impact,” she added. O’Keefe says that running has given her so much personally, by building self-confidence and allowing her to become more physically fit, and even says that running is like her free therapy. O’Keefe indicates that, as a result of running, she has found a stronger, cooler version of herself that she did not even know existed. Special Thanks to State Senator Bob Gordon and Mayor Lisa Swain of Fair Lawn! A special thank you to State Senator Bob Gordon and his wife Gail Gordon for Co-Chairing the Glen Rock Cupid’s Chase 5K Run. 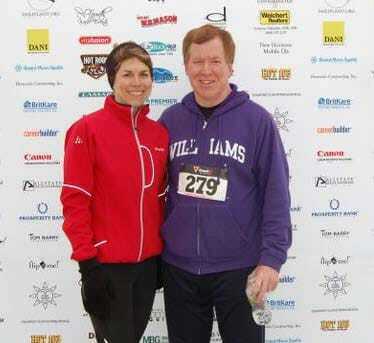 The Senator and his wife were able to raise thousands of dollars to support the run and the mission of Community Options. Senator Gordon ran in the Glen Rock Cupid’s Chase alongside hundreds of participants, including Mayor Lisa Swain of Fair Lawn, NJ. Mayor Swain was highly supportive of Cupid’s Chase by getting her entire run club involved, North Jersey Masters! Thank you to all of you for all of your support and we will see you next year! January 31, 2011 (Princeton, New Jersey)- Nonprofits celebrate their accomplishments in many different ways. Community Options, a national nonprofit that supports people with disabilities has been working diligently on their annual 5K Run, Cupid’s Chase, since March of 2010. People like Mary Pat Christie, First Lady of New Jersey as the national Honorary Chairperson and corporations like Withum Smith + Brown, Gunlocke Furniture, Dani Leather, Haldeman Ford and the Bloomberg Foundation have already made this upcoming event a great success. All of these corporations and the many more sponsors of the Cupid’s Chase have an individual and organizational commitment to corporate social responsibility. Community Options has worked tirelessly to garner the support of major corporations across the country for the Cupid’s Chase 5K Run and the mission of supporting people with disabilities. “I encourage corporations across the United States to become involved with the Cupid’s Chase 5K Run that supports an important cause – community housing and employment for people with disabilities,” says Mary Pat Christie. “Community Options is a fantastic cause to align with to increase your corporate social responsibility efforts,” she added. As a result of this hard work, Community Options, alongside it’s corporate partners, Withum Smith + Brown, Gunlocke Furniture, Dani Leather and even Senator Joe Kyrillos of New Jersey’s 13th Legislative District will be ringing the Opening Bell at the NASDAQ on Tuesday, February 1, 2011 just in time for the upcoming national Cupid’s Chase 5K Run on Saturday, February 12, 2011. “Ringing the Opening Bell at the NASDAQ is the symbolic culmination of the work the organization has done this year to prepare for our largest annual fundraiser,” says Robert Stack, President and CEO of Community Options. “We are very lucky to have the corporate partners we have and the support of the First Lady of New Jersey, Mary Pat Christie, all of which have made this upcoming event already a great success,” he added. The group will be ringing the Opening Bell at the NASDAQ to celebrate the finest of corporate social responsibility and couldn’t think of a better way to thank their corporate partners than to invite them to ring the bell with the organization. All of the proceeds from the upcoming Cupid’s Chase and the over $100,000 raised over the past year to support the run, will go directly to support people with disabilities the organization supports. Recently Oprah Winfrey had New Jersey Governor Chris Christie accept a $100 million donation from Mark Zuckerberg, founder of Facebook to improve Newark’s school system. I give Mark an A in Corporate Social Responsibility. When asked in a January 30, 2011 interview about why he gives to charity, Michael Bear, Lord Mayor of the City of London said, “We all have an obligation to help those at risk and who are less fortunate.” He adds that his most passionate cause is supporting vulnerable people. In the state of the state, President Obama proposed a freeze on domestic spending but said that the most vulnerable should be protected. The ostensible logic behind the stimulus package was to improve the economy. The mantra by every elected official is jobs, jobs and jobs. Nurturing small business and tax cuts are navigational methodologies to exodus the maze of a bad economy. The small business mantra is one answer, but it is not the panacea. A simultaneous strategy is suggested. Government leaders need to look at the non-profit sector as a viable option. In New Jersey alone there are almost 300,000 people employed in the non-profit sector. It may not pay the same salaries as Wall Street but as the cliché goes it is main-street. Ameliorating the non-profit sector not only creates jobs and improves the economy, it actually improves the human condition. On February 1st, my colleagues and I will be ringing the NASDAQ opening bell celebrating Corporate Social Responsibility or CSR. I was chosen to do this because of a 22 year old non-profit, Community Options. Incorporated in 1989, Community Options started in a small row home in Bordentown, New Jersey. Today with an $80 million annual budget and over 2,500 employees there is cause to celebrate the microcosmic but still effective potential that this idea turned into throughout the country. The mission is to develop housing and employment for persons with disabilities. The federal, state and philanthropic principles have figured out that Community Options and many other non-profits provide a higher quality and more affordable product than the government. The cost of an institution for people with disabilities is double that of a community program. Over the last 10 years, in spite of the recession (or possibly because of it) Community Options has grown about 10% per year, every year. Community Options has purchased over 150 residences and in this housing market can only prove to show positive ramifications. As a non-profit we do great things and we are obviously not infallible, however, the governmental regulatory oversight is comprehensive and rigorous. So many elected officials are waking up to the severe deficits in their counties, states and of course the $1.5 trillion federal deficit. They are looking at these horrific budget shortfalls against a backdrop of not making the most vulnerable even more vulnerable. With ringing the opening bell at the NASDAQ and all of us celebrating corporate social responsibility, we will also be celebrating our upcoming Cupid’s Chase which will be the largest nationwide 5k race held on Feb. 12 in 24 cities and ten states. We have experienced and continue to experience nationwide the new matrix of CSR. With our Chair, Mary Pat Christie, First Lady of New Jersey, we know it will be a wonderful success. We need greater awareness of how non-profits assist with the most vulnerable, help the economy, find jobs and improve society.